There are a whopping 125 cameras inside Mercedes-Benz Stadium, working the College Football Playoff National Championship Game tonight for ESPN. The most interesting additions to this year’s telecast may be four wireless cameras embedded in the 1st-and-10 markers positioned on the sidelines. 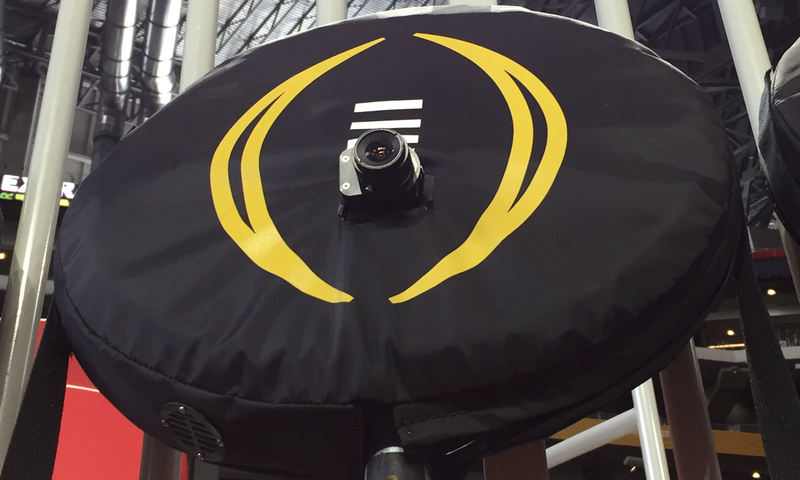 RF cameras from 3G Wireless have been mounted into the 1st-and-10 markers for ESPN’s coverage of tonight’s big game. Yes, even the Chain Gang is armed with cameras. Looking for deeper access and an angle that fans at home have never seen before, ESPN turned to 3G Wireless, a company known for its success in RF-based broadcasting to develop these unique devices making their wide ESPN debut tonight. The yard markers take cameras to places on the field when ESPN has never ventured before. The system features a proprietary 1080p camera built into the tops of the yard markers. Inside that casing is also a RF transmitter and a battery. At the base are a small vent and a fan that keep the camera system from overheating. The system has been tested twice, at the Celebration Bowl and the Sugar Bowl (where it actually made air a handful of times). Those games gave ESPN a chance to experiment with the camera unit itself, which started off with a 3.9mm lens but has been narrowed down. The proprietary camera system also allows interface and camera-control functions, including iris control and painting. The feed from the camera goes directly into a telemetry hub that allows the crew to remotely control it.